Any country in which I can afford without too much difficulty to rest my weary travelers’ bones at the finest hotel in that country is one that I’m predisposed to like. The same predisposition applies to any country featuring mountains snow-capped in July and with valleys a hundred miles long – unending greenness on steep hillsides and ruins of castles and battlements only add to my inclination toward approbation. Georgia fits the bill on all counts. We drove up the Military Highway, which was built by the Soviets for transporting armies and trade goods south across its border with Georgia (read here for a brief history of the relationship between the two countries) and originally was a rough route used by the czar’s armies in the 19th century. The road is narrow, two-laned, and at times perilous – guard rails are not the norm here – but it is as beautiful as it is nerve wracking. A wide valley at the exit from Tbilisi northwestward narrows as the highway turns more directly to the north (and passes quite close to the Russian-occupied zone in north-central Georgia). We drive along a rockslide-prone route taking us around a large, human-made lake. A dam at its southern end holds back the torrent that would ensue in its absence at the yearly snow melts of the staggering Caucuses mountains. 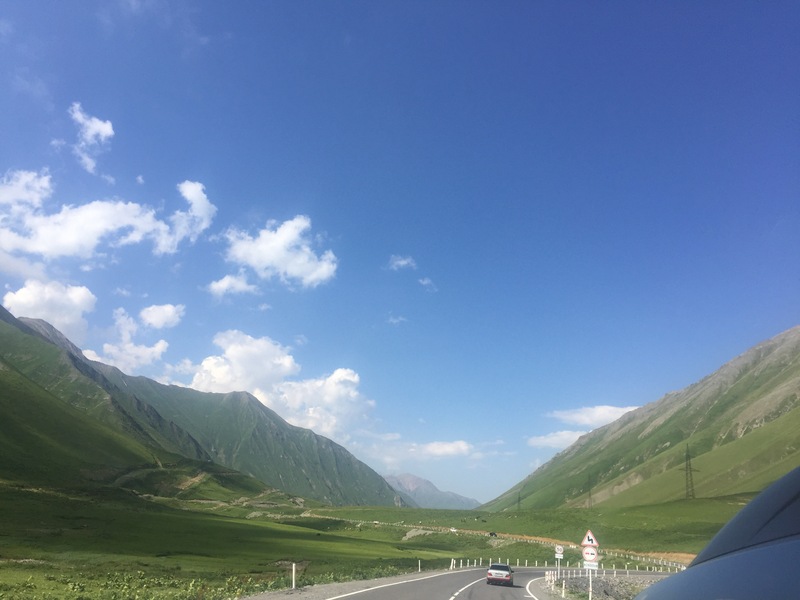 The place is green – verdant with leafy trees – until we reach a place above the tree line, which is surprisingly low as compared with similar places in the United States (around 7 thousand feet / ~2100 meters as compared with upwards of 11 thousand feet in the U.S.). Road work is treacherous for both drivers and workers, and as we descend into a second major valley below the Kazbeg Mountain (a massive peak of around 16,500 feet), we face a few of the sketchier bits of road in downhill switchbacks and narrow tunnels. Cars pass us on blind turns and hills, and some have to abandon bold moves and squeeze back into our lane before achieving dominance over the pack. We also dodge cows and donkeys, both of which frequently settle in the middle of the road or cause the line of half-broken-down vehicles to find itself at a complete standstill. Watch out for deep ditches dug into the sides of the roads, as well. The scenery competes with those of Switzerland and the American Rockies for most lovely mountainscapes. 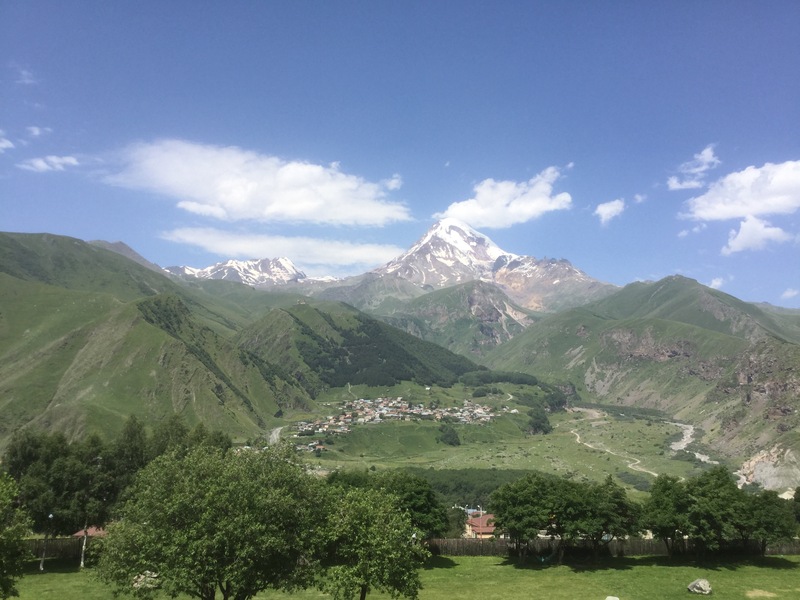 The hotel – “Rooms at Kazbegi” – is apparently a former Soviet tourism office, but you would have no way of knowing this from its chic, wood-and-leather look. Rooms run from about $150/night, the breakfast buffet is the best I’ve ever had, and the service is quite good by Georgian standards (that is to say, it’s worse than basic hotel standards in the USA, but still quite impressive by relative comparison). The staff are well educated and usually speak three or more languages (the majority of tourists here are Russian, but they are also English-speaking or hail from the Arabian Peninsula. They often do not follow through on food and drink orders placed by patrons, however pleasantly and helpfully the orders are received and sometimes noted. There’s an oddity here: the hotel is heavily staffed, and the waiters often seem to hover at their enthusiasm for attending to guests’ needs, but they seem to lose the thread after asking after our requirements. Bring your own water, for your bottle of still won’t arrive for twenty to thirty minutes, if it arrives at all. Curious. 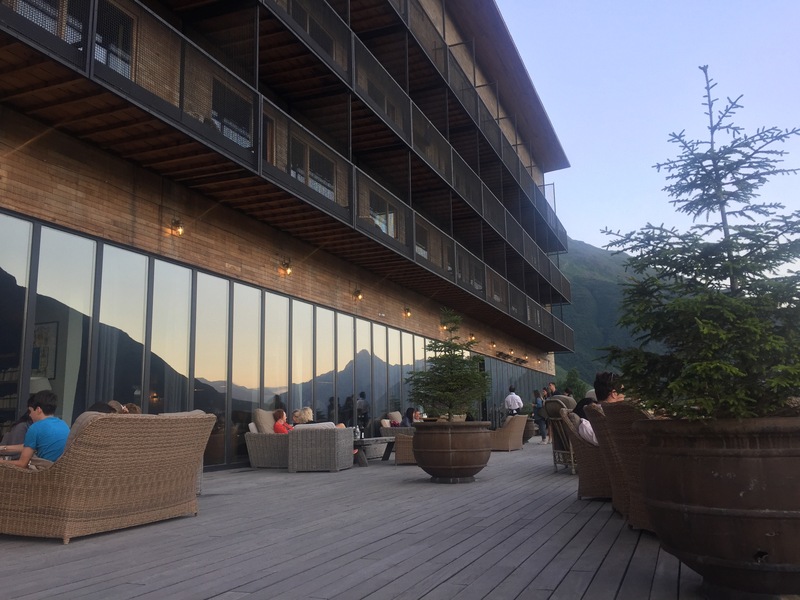 The views of the mountain are superb, particularly from the wide and popular terrace, and the “forest view” rooms face a smaller but closer-at-hand mountain. The hotel offers unaffordable (to me) helicopter rides. A defensive radar array (pointed toward the Russian border northward and “up”” the valley from here) and a Georgian Orthodox Church / monastery sit atop ridge tops to the west across the valley. The ground floor is an open floor plan of assorted chairs, low tables, and a bar whose tender can make anything simple that’s not coffee or a martini (so says my host). The walls in this hotel are paper thin, which leads to some annoyance and much amusement, depending on one’s neighbors. The wooden floors throughout the hotel hallways and bedrooms do not end in the bathroom, where rainspout showerheads pour non-potable water down and between timber-slatted floors and against limestone (I believe) wall panels. This is, I am told, the finest hotel in the country. I believe it, given the host knowledge and the write ups I’ve found describing it (please see and read the Economist’s 1843 magazine, which details more of the cultural history of this road and its surroundings). The military highway here is worth seeing, and the hotel worth visiting. The confluence of and competition between old and new – the attempts to move from past into the present – are reminiscent of everything else in this country, which is adorable on the whole. Follow along the whole summer’s travels here, all of my travel posts from this page… and subscribe to the blog – you’ll get an email each time I post something new. This entry was posted in Travelogue, Travelogue 2017, Travels and tagged backpacking, caucuses, caucuses mountains, Culture, georgia, hotels, luxury, military road, republic of georgia, russia, Slow Travel, Tourism, travel, traveling, travels. Bookmark the permalink.